This year has seen a very good number of Cowslips in flower at the site, but also at Wilford Claypits and on Collington Common. In total nearly 4,000 flower spikes have been counted. Also good news is that the number of Green Wing Orchids was up this year and whilst number are drastically down from the flooding a fourfold increase from last year suggests the population is graduly reestablishing itself.. Very soon (if not already) the Southern Marsh Orchids will be coming into bloom and I am hoping to see the Bugle again this year (a few flowered last year for the first time since the flood). But where are all the butterflies ? Don`t forget Wilwell Open Day on Sat 11th June. This is our annual fund raiser and last year helped us contribute £1,500 to help support the work of Notts Wildlife Trust..Please come along this year and support us. It is at the St Peters Rooms in Ruddington (NG11 6HA) opposite the church from 9.30 till 12. Individual Category – Harry Eustace (Friends of Sharphill Wood) who joined the group’s work parties as part of his Bronze Duke of Edinburgh Award, and has become a work party regular after getting his Bronze and introduced his younger brother to the work party as well. Harry is a focused and hard worker, carrying out dead hedging, maintaining the paths, coppicing and felling small trees, as well as competent in the planting and aftercare of small hedging whips. Group Category – Holme Pierrepont Country Park Group for their work over the last year to introduce more wildlife friendly features and habitats into the park including clearing Hymalyan Balsam, creating a bird hide, making and installing bird boxes, creating a spring wildflower garden and opening up a stagnant pond. 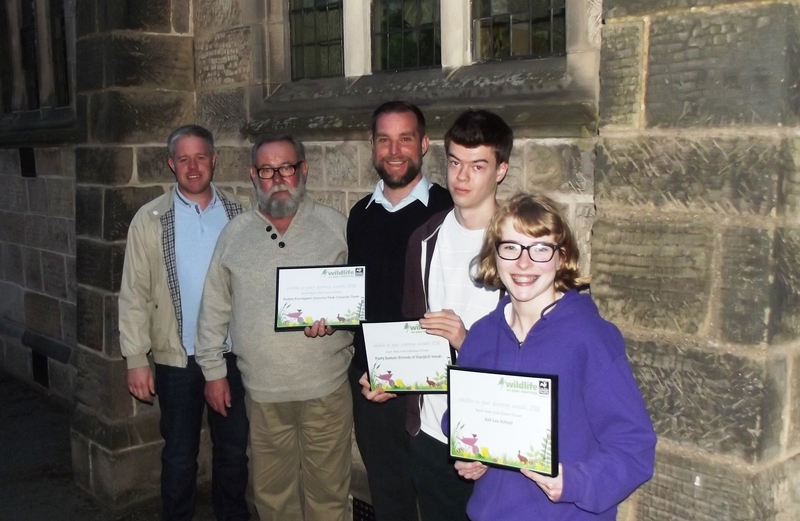 Schools Category – Ash Lea Special School for the hard work put into creating maintaining their wildlife garden over the years The school is also supporting the Trusts work at Skylarks coming along to to carry out conservation tasks as well as survey work. Tom Shields (Skylarks NR), Patsie Andrew (East Bridgford Wildlife Group),Jenny Craig (Bingham Linear Park) in the individual category and Gotham Sandbanks Nature Reserve, Stonepit Wood Group, Skylarks Sunday Group and South Notts Bird Ringing Group in the group category.